Small/Medium - $72.99 Only 3 left! Medium/Large - $72.99 Only 2 left! According to most of the original stories, Robin Hood was a man. And according to any good storyteller, there’s nothing wrong with taking a little creative license. So make a little tweak here, or a plot adjustment there. And while you’re at it, why not change some of the characters’ sexes? Look! 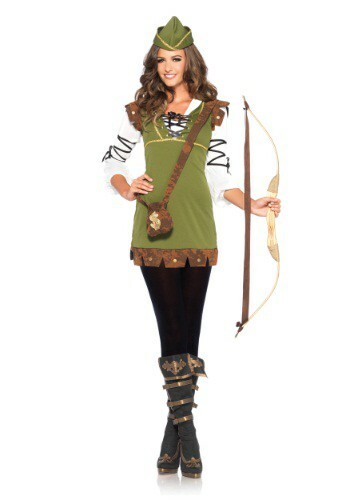 We’ve already got a Women’s Classic Robin Hood Costume ready for your updated version of the old tale! Hey, this is a pretty exciting project. Do you mind if we make a few other suggestions? We were thinking that Robin Hood could be in love with a prince named Marion, who’s being held in a tall tower by his manipulative father in hopes of marrying him off to some rich noblewoman. Actually, that’s pretty much the only idea we’ve had about the story. Though we do think it’s worth asking Lil Jon the rapper to play Little John the merry man in the inevitable film adaptation! Or maybe that’s too obvious. Okay, he can be Friar Tuck! Hmm. Maybe it’s for the best that we aren’t in charge of the revisions!